Point of Difference: “going slightly potty” is quite different to “I go potty”, as is “I’m going to get promotional seedpots“… Let’s assume the later is on your mind – and consider some of the benefits coming to those who decide to invest in old, arable technology! Some promotional products are static yet functional in nature and others demand you interact with them in order to realise their purpose – a promotional beach ball for instance, or a promotional pen are obvious choices. You could of course gift a plant to a client, customer, staff member or sports team member. They could look at it and admire its form, and in most cases, watch it wilt and die. Studies in retirement homes have linked good health with responsibility for pets and plants – you hear of visiting therapy dogs, don’t you? The old dears love ’em and I’d personally like to pat a dog while listening to Sanatra and digesting my tea and biscuits…..actually, riding a stallion while listening to AC/DC and nursing a hangover are far more my style….but each to his own! Nevertheless, caring for an animal or tending a plant are therapeutic activities whether you’re elderly or of working age. If you gift a promotional seedpot, the chances are, your target will follow the instructions to grow their own beautiful flowers, then follow through with their watering and care. It’s that early investment and connection with a living entity that promotes nurturing. 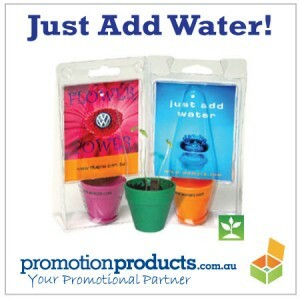 Promo seedpots are a gift that keeps giving and demands personal investment. Your gift with printed log or message is your buy-in to that process and your name will be indelibly be linked to the satisfying, age old practice of gardening for pleasure. This entry was posted in business gifts, Desk and Office, Environment, Fun and Leisure, Promotional Products and tagged enviro, hipster, novel, office by admin. Bookmark the permalink.